Rinse the chicken in cool water, pat them dry and remove any fat. Place the chicken breasts on a sheet pan and rub them with olive oil and sprinkle them generously with kosher salt and pepper. Roast the breasts for 35 to 40 minutes, until the chicken is cooked through and the internal temperature reaches 165 degrees F. Set aside to cool. When the chicken is cool, remove the outer boarder of the breasts as it may be too overcooked and cut the chicken into ½ -inch diced pieces. In a medium bowl combine the diced chicken, add the mayonnaise, celery, currants and chopped pecans and combine well. 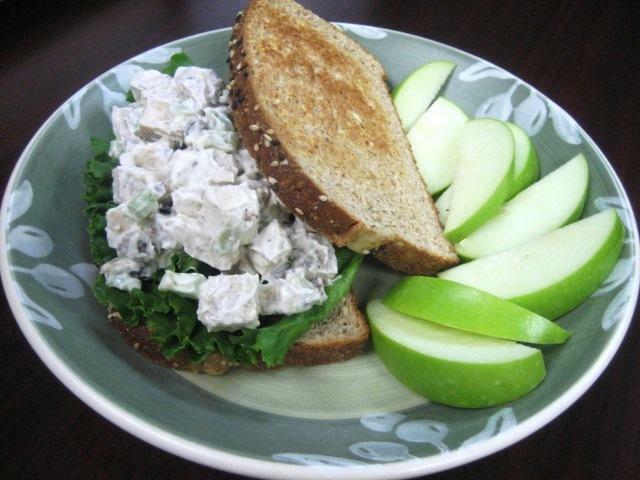 To assemble the sandwich, toast multi-grain bread, allow the toast to cool and lay down green leaf lettuce and top the lettuce with the chicken salad. Cover with another toasted slice of multigrain bread and serve.